Every "Dark Magician" in your Monster Zone is unaffected by your opponent's card effects. If this face-up card leaves the field: Destroy all monsters you control. You can only use the following effect.. Cannot be Normal Summoned/Set. Must be Special Summoned (from your hand) by Tributing 1 "Forbidden One" monster, and cannot be Special Summoned by other ways. This card gains 1000 ATK for each "Forbid..
Pay 2000 LP, then target 1 Level 4 or lower monster you control; for the rest of this turn after this card resolves, you cannot Special Summon monsters, also Special Summon 2 monsters from your Deck, ..
You can target 1 monster on the field; send 1 "Forbidden One" monster or "Exodia" card from your hand or Deck to the Graveyard, and if you do, return that target to the hand. If this card is sent from.. Cannot be Normal Summoned/Set. 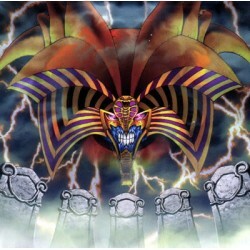 Must be Special Summoned with "Contract with Exodia", and cannot be Special Summoned by other ways. Cannot be destroyed by battle or Spell/Trap effect. Once per turn, du..
Each time a Spell Card is activated, place 1 Spell Counter on this card when that Spell Card resolves. You can remove any number of Spell Counters from this card, then target 1 face-up monster on the ..
You can Tribute this card; Special Summon in Defense Position, a number of "Block Tokens" (Rock-Type/EARTH/Level 4/ATK 1000/DEF 1500) equal to the number of your turns this card has been face-up on yo.. If this card is sent from the field to the Graveyard: Add 1 monster with 1500 or less ATK from your Deck to your hand, but you cannot activate cards, or the effects of cards, with that name for the re..